7/21 Cup of Coffee: It was a full slate of games in the system on Thursday. Portland powered up with a five-homer victory. Salem came from behind to maintain its one-game lead in the Northern Division. Jalen Beeks carried a no-hitter into the sixth inning before running out of gas, and Tzu-Wei Lin (pictured) had a three-hit night after starting his Triple-A assignment with a 1-for-9 stretch. After cruising through five hitless innings, starter Jalen Beeks was touched for three runs apiece in the sixth and the seventh. Beeks gave up three home runs after having surrendered only five in 93 innings all season. Top prospect Rafael Devers was 0 for 3 with a walk, as his average dipped below .400 for the first time since his promotion from Double-A. 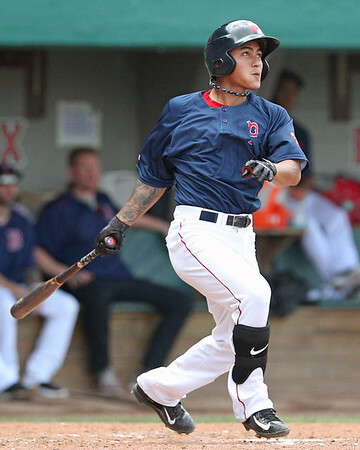 Tzu-Wei Lin had three hits, while Josh Rutledge began his rehab assignment by going 1 for 4 with a double. The Sea Dogs exploded for five home runs in Thursday night's rout. Former UConn star Mike Olt blasted a three-run homer as part of a 3-for-3 performance. Jordan Procyshen also had a three-run shot, while Jeremy Barfield, Danny Mars, and Chad De La Guerra also went deep for Portland. The offensive explosion assisted Elih Villanueva, who surrendered three home runs of his own but went five innings for the win. Josh Smith followed with three scoreless frames out of the bullpen, and Jake Cosart struck out three in a scoreless ninth to seal the win. Chris Madera capped a big day at the plate by driving in the go-ahead run in the top of the 11th inning. It was the second RBI of the night for the center fielder, who went 3 for 6. Mike Meyers and Victor Acosta added doubles as part of their two-hit nights. Matthew Kent got the call in place of scheduled starter Dedgar Jimenez, who was promoted to Portland earlier in the day. Kent allowed four runs on seven hits in five innings. Stephen Nogosek got the win with two perfect innings, striking out two, and Daniel McGrath struck out a pair in the 11th to notch the save. It was a short evening for 18-year-old righty Bryan Mata, who went only three innings, allowing two runs on three hits. He received little support from the Greenville offense, which registered only four hits while striking out 17 times. Granger Studdard had the only multi-hit game, going 2 for 4. Santiago Espinal was 1 for 3 with a walk, and was the only member of the Drive lineup not to strike out. A trio of Lowell hurlers combined on a five-hit victory. Starter Enmanuel De Jesus allowed only two hits and one run over five innings, walking two and matching a career high with eight strikeouts. Lukas Young and Juan Florentino followed with two scoreless innings apiece. Juan Barriento led the Spinners offense, scoring a pair of runs while going 2 for 3 with a walk. Third-round pick Brett Netzler also had a pair of hits. In the the completion of Wednesday's game suspended by rain, the Sox were shut out by a handful of pitchers. The first of those pitchers was 2013 first-round pick Hunter Harvey (BAL), who pitched an inning in his first game back from Tommy John surgery. Matched up against Harvey was Juan Perez, who fired three no-hit innings before the game was suspended in the top of the fourth. When play resumed, Ritzi Mendoza took over on the mound, with the right-hander allowing three runs on six hits to take the loss. Andre Colon and Zack Sterry had two hits apiece for the Sox. The Sox were apparently saving all of their offensive firepower for their regularly-scheduled contest. Colon had another two hits, giving him four across both ends of the doubleheader. Alan Marrero turned in a monster game, going 3 for 4 with a home run, double, two runs scored, and four RBI. Everlouis Lozada also drove in four runs with a 2-for-3 afternoon that included a double, while David Durden went 4 for 4 with a pair of RBI. Rayniel Adams allowed two unearned runs in four innings, and Rio Gomez got the win in relief with three scoreless frames. It took extra innings to end the Sox seven-game winning streak, as the Marlins handed the team only its third loss of July. Alexander Martinez doubled and drove in a run, while Angel Gonzalez and Eduard Conde both had two hits in the losing effort. The loss negated a strong effort by the Sox pitching staff, particularly starter Rayniel Moreno who allowed two runs (one earned) on five hits in five innings. Player of the Day: Entering Thursday's action, catcher Alan Marrero had only three career extra-base hits in 105 plate appearances. The 2016 eighth-round pick was highly touted coming out of Puerto Rico's International Baseball Academy, but his offense had been lagging behind with a career .128/.286/.209 slash line. A home run and a double raised his career OPS nearly .100 points, and the four RBI were more than he totaled in 70 plate appearances last season.